The main objective of The Philosophy of Play is to provide a richer understanding of the concept and nature of play and its relation to human life and value, and to build disciplinary and paradigmatic bridges between scholars of philosophy and scholars of play. 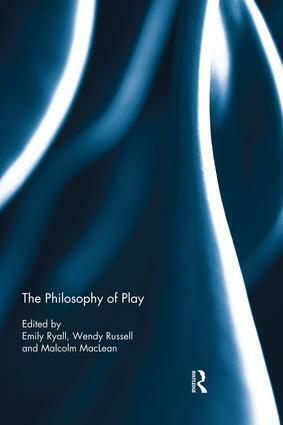 Including specific chapters dedicated to children and play, and exploring the work of key thinkers such as Plato, Sartre, Wittgenstein, Gadamer, Deleuze and Nietzsche, this book is invaluable reading for any advanced student, researcher or practitioner with an interest in education, playwork, leisure studies, applied ethics or the philosophy of sport. "(…) I am sure that many other scholars and practitioners of play may be enchanted by reading here and there in this much welcome and highly commendable, and recommendable work of play and play of work. The Philosophy at Play conference organizers and book editors, Emily Ryall, Wendy Russell, and Malcolm Maclean deserve high praise indeed for their great efforts in reviving play." Emily Ryall is Senior Lecturer in Philosophy at the University of Gloucestershire, UK. Her main area of expertise is in the philosophy of sport, in addition to an interest in broader ethical and conceptual issues. She is on the editorial board of the Journal for the Philosophy of Sport and has published work in peer-reviewed journals and edited collections as well as sole authored books. Wendy Russell is Senior Lecturer in Play and Playwork at the University of Gloucestershire, UK. She has over 35 years experience as a playworker, specifically in development, research, education and training. Her research interests focus on play, childhood, space and politics and she is particularly interested in the dialectics of adult involvement in children’s play. Malcolm MacLean is Associate Dean (Quality and Standards) and teaches in the Faculty of Applied Science at the University of Gloucestershire, UK. His research work explores cultural politics, sport as a form of body and movement culture and the political economy of knowledge production in contemporary higher education.